It all started when I was loitering in the kitchen, sniffing the cupboards, peeking in the fridge and had absolutely no idea what to make for dinner. It happens sometimes. Very rarely, but it does. Usually when I have cooked a lot lately and then just want something fast and easy to fill my belly. So I just started boiling the rice, grating the carrots and chopping the cabbage. I also grabbed a pack of roasted and salted peanuts. And magically, dinner was served. I must say that I'm not the biggest rice fan. I eat it and I like it but it isn't usually my first choice. When eating out at an Asian restaurant, I ALWAYS order noodles as a side instead of the rice. Rice seems so boring. This recipe is ultra simple but I was surprised how quickly I wolfed it down. I had no plan to make a recipe out of it, but it was just that good in its simplicity. And why not to share the good stuff? Sometimes you don't think of the simple and simple can be just what you need. 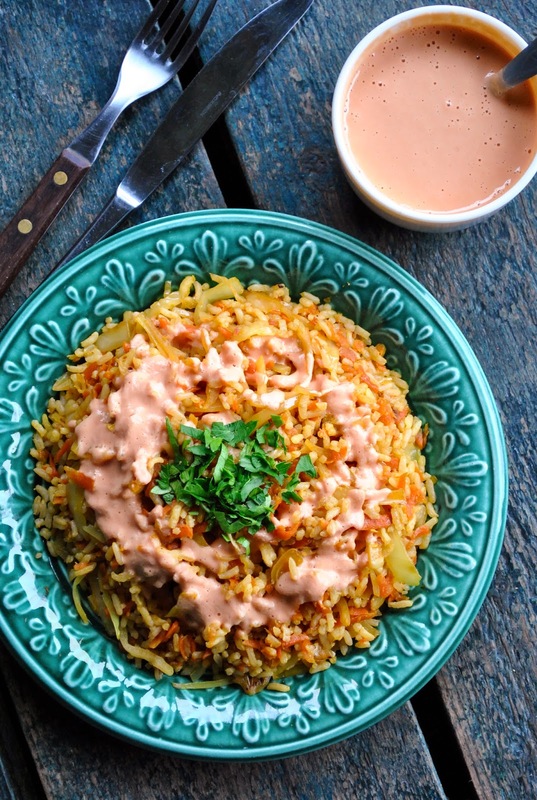 This rice and crunchy juicy veggies were just perfect with the hearty and creamy peanut and tomato sauce. Such an awesome combo. I loved the meal so much, I had to make it again next day to take a photo and write down the ingredients. Boil the rice in salted water until soft. Drain and rinse slightly with cold water. In the meantime heat up the pan. Add oil and grated carrots. Cook for a couple of minutes. Tightly squeeze the cabbage shreds with your hands and add them to the carrots along with salt and pepper. Cook, until the veggies start to brown. Add soy sauce or tamari and stir. 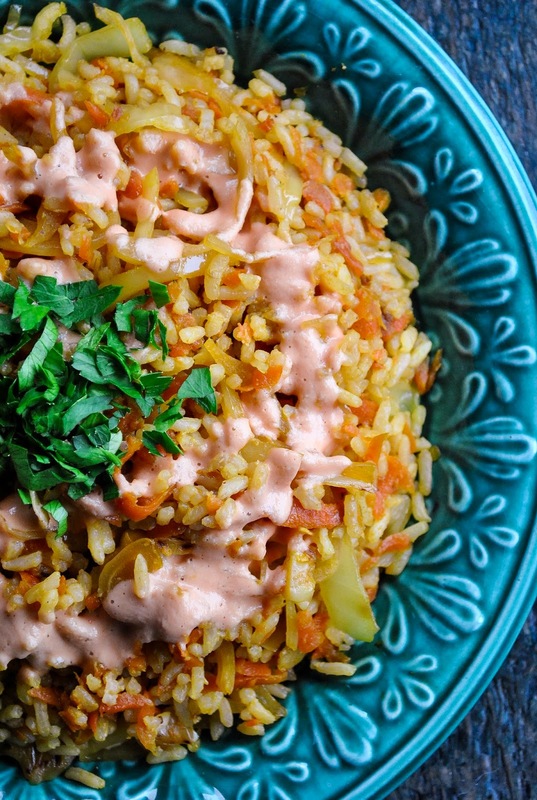 Mix boiled rice with veggies and serve with peanut and tomato sauce.